The three Responsories have a complex structure of plainchant verses and repeats, and form a transitional stage between earlier pieces written for the full-blown Catholic rite and the developing syllabic writing of the Anglican church. The third, Homo Quidam Fecit Coenam, is the most interesting, with its six parts. A different Cantor is used for each of the three Responsories, something I am never too sure about in anything approaching a liturgical setting – I have a feeling that most religious intuitions would have had a single Cantor. We move from Latin Catholic music to Anglican for the rest of the CD, starting with two rather curious pieces (that may not be by Tallis) from 17th century sources, Christ Rising Again and Out from the Deep. Tallis adopts Cranmer’s English for the Office of Matins from the Short (‘Dorian’ or ‘First’) Service that makes up second half of the CD. Two sets of Responses enclose a Venite, Te Deum and Benedictus. As the Psalm settings are incomplete, two examples from the Archbishop Parker translations are used. The service finishes with a Litany, here in a reduced form omitting the more rabid anti-Catholic sentiments. 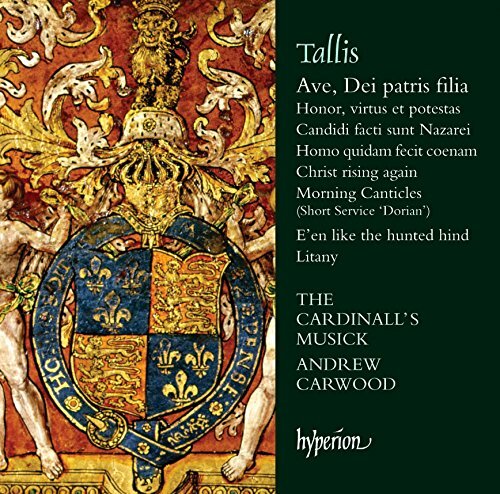 The singing of The Cardinall’s Musick is always characteristically bold and forthright, perhaps a relic of their earlier experience of singing in the vast acoustic of Brompton Oratory, and Andrew Carwood’s more recent experience in St Paul’s Cathedral. Although this style is generally fine for projecting into a large space, it does have implications in recordings. Although the Fitzalan Chapel in Arundel Castle has a generous acoustic, the microphone positions mean that we are hearing the singers fairly close up, albeit with an attractive acoustic bloom. The detailed vocal characteristics of each voice are exposed, and not always for the best. For example, in the first three Responsaries the soprano voice sounds consistently shrill and prominent, the force of her voice producing a vibrato that raises intonation questions. Another soprano (Amy Haworth) joins for the long Ave, Dei Patris Filia with a far more appropriate vocal style. The two sopranos are jettisoned altogether for all the other pieces on the CD, but that brings into prominence one of the two counter-tenors who can also sound rather shrill, albeit without vibrato and with perfect intonation. With several days of recording and plenty of chance for re-takes I assume that this is exactly the sound that is intended, so it is a matter of personal taste.